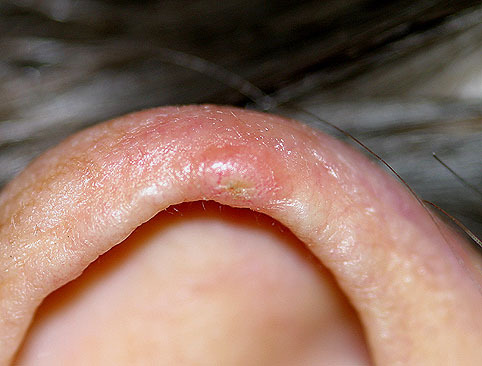 Chondrodermatitis nodularis chronica helicis (CNH) is a common, benign, inflammatory , often crusted, painful condition characterized by papule or tender nodule most commonly found on the helical rim of the ear of auricle (helix or antihelix of the ear). Less commonly the antitragus may be involved. Being the lesion typically painful and tender (frequently present with exquisite tenderness that interferes with sleep), for this reason the patient seeks help shortly after the onset of symptoms: sleeping on the side of the affected ear is impossibile. 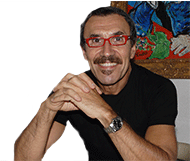 CNH more often affects those between 50 and 80 years of age, particularly men and most frequently is unilateral. It is seen less commonly in women and younger individuals, even if pediatric cases of CNH have been reported. The exact cause of CNH is unknown, but it has been postulated as inciting trigger the prolonged and excessive pressure in ear with predispose anatomic features . 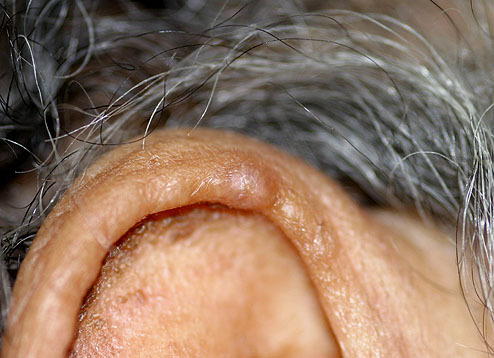 The ear has relatively little subcutaneous tissue for insulation and padding, and only small dermal blood vessels supply the epidermis, dermis, perichondrium, and cartilage. Focal pressure on the stiff cartilage produces damage to the cartilage and overlying skin. Anatomic features of the ear, prevent adequate healing and lead to secondary perichondritis. The condition usually continues unless treated adequately. Usually the classic presentation is an elderly man with a spontaneously appearing painful nodule on the helix . The nodule usually enlarges rapidly (few months) to a size of 4-10 mm, and remains stable indefinitely. The patient presents for help because of the pain associated with the skin lesions. The lesion is discrete, round to oval shaped with raised rolled edge, and a central ulcer or depression which often contains a crust or scale. The color may be grey to red but often is similar to that of the surrounding skin. The size range from 4-10 mm. (or more). In men almost all nodules are situated at the upper pole of the helix. Habitually sleeping at night on the affected side is the principal etiologic factor. When asked, the patient usually admits to sleep on the affected side. Pressure may induce microvascular injury and subsequent compromised local blood supply to the underlying cartilage and skin. A clinically distinctive feature of CNH is the pain associated with the skin lesion. In contrast, cutaneous tumors, such as Basal Cell Carcinoma, Keratoacanthoma, Squamous Cell Carcinoma are usually painless, even when ulcerated. . But often, biopsy is necessary if patients with CNH have chronic solar damage and a history of skin cancer. First of all, it should be stressed that this is a benign condition. So the initial management should be aimed at conservative therapy. The primary goal should be to reduce or eliminate pressure at the site of the lesion. Not easy to achieve because of the patient's preference or necessity to sleep on the side of the lesion. A home-made pressure-relieving prosthesis can be fashioned by cutting a hole from the center of a bath sponge, held in place with a headband, or can be use specially designed pillows. Injectable collagen implants is an effective and practical method by providing cushioning between the skin and cartilage. If these approaches are unsuccessful, excisional approaches almost always are needed. Knowing that CDN is caused by pressure necrosis of protuberant cartilage, excision of the cartilage alone under local anesthesia has been demonstrated to be therapeutically and cosmetically effective. At this time, excisional surgery offers the best option comparing to other therapeutic modalities.